Searchable audio files now convert video archives into highly accessible and discoverable content. Today at Enterprise Connect, VoiceBase – a leading provider of easy-to-use speech APIs – announced that VBrick has enhanced its video search capabilities by integrating the VoiceBase API to provide on-demand transcription services to Rev customers. The VoiceBase-powered transcriptions will be part of the core search process in Rev. Videos with a match in the transcript will be displayed so that users can jump to, and playback, the precise points in that video where the search term is mentioned. “This integration with VoiceBase shows our commitment to continuous and rapid innovation in our next-generation Rev platform,” said Brian Dreyer, Rev Product Management Director for VBrick. “Searchable audio files convert video archives into highly accessible and discoverable content. This is the first step in a series of search innovations we plan to unveil in the coming year,” continued Dreyer. VBrick pioneered the next-generation of enterprise video through Rev® cloud-native platform. Named the market leader in Enterprise Video Webcasting for two consecutive years by industry analysts Frost and Sullivan, VBrick’s platform allows organizations to use video ubiquitously by converting it into bandwidth-efficient streams that can be securely viewed through a web browser from any connected device. Built to leverage any cloud platform, organizations can reach audiences in the tens of thousands, compared with a few hundred using traditional web conferencing services. 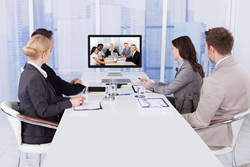 VBrick Rev enables organizations to centrally integrate all of their video sources, including video conferencing and unified communications, while delivering a dynamic, consumer-grade experience for employees. Visit http://www.vbrick.com.